Ocupa parte del convento de los Carmelitas construido entre 1768 y 1771. En esta parte se encontraba la portería del convento. En el interior se encuentra el Claustro de las Procesiones. Confiscado por la Reforma, fue destruido en parte. El edificio ha sido usado como cuartel, bodega, cárcel y oficinas. Fue declarado monumento nacional el 28 de junio de 1936. Actualmente alberga las instalaciones del Museo del Virreinato. It occupies part of the Carmelita’s Convent, built between 1768 and 1771. The caretaker’s lodge was located in this side. Inside, the Procession’s Cloister can be found. During the Reformation years, it was confiscated and some of its parts were destroyed. The building has been used as barracks, warehouse, jail, and offices. It was declared national monument on June 28, 1936. Currently, it is the Viceregal Art Museum’s building. The marker can be seen to the right of the main entrance to the museum. 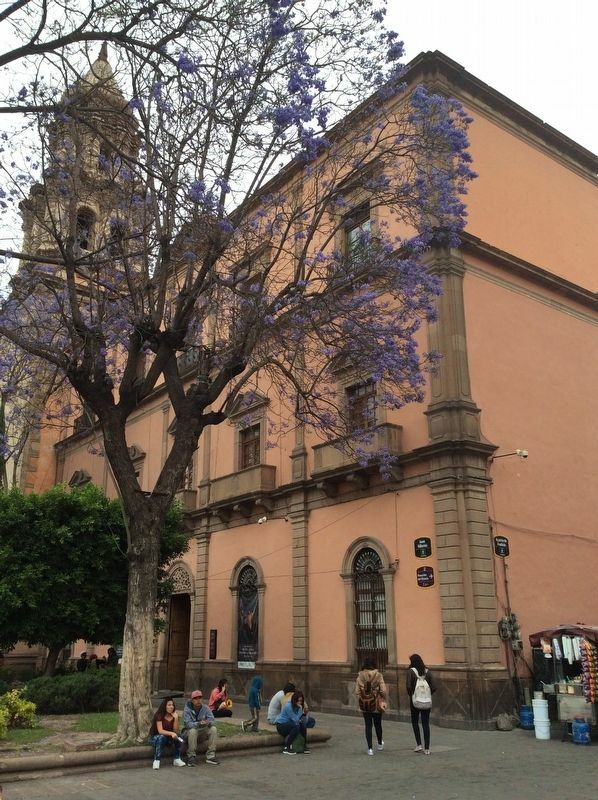 San Luis Potosí. Marker is on Mariano Escobedo just north of Vicente Guerrero, on the right when traveling north. Touch for map. Marker is in this post office area: San Luis Potosí 78000, Mexico. Touch for directions. Other nearby markers. At least 8 other markers are within walking distance of this marker. Temple of Carmen and Ex-Convent of the Barefoot Carmelite Religious Order (a few steps from this marker); Teatro de la Paz (within shouting distance of this marker); Museum of Masks (within shouting distance of this marker); Española Bookstore (about 150 meters away, measured in a direct line); San Agustin Temple (about 150 meters away); Temple and Ex-Convent of San Agustín (about 150 meters away); Tribute to the Heroes of Mexican Independence (about 180 meters away); Pitman House (about 180 meters away). Touch for a list and map of all markers in San Luis Potosí. More. 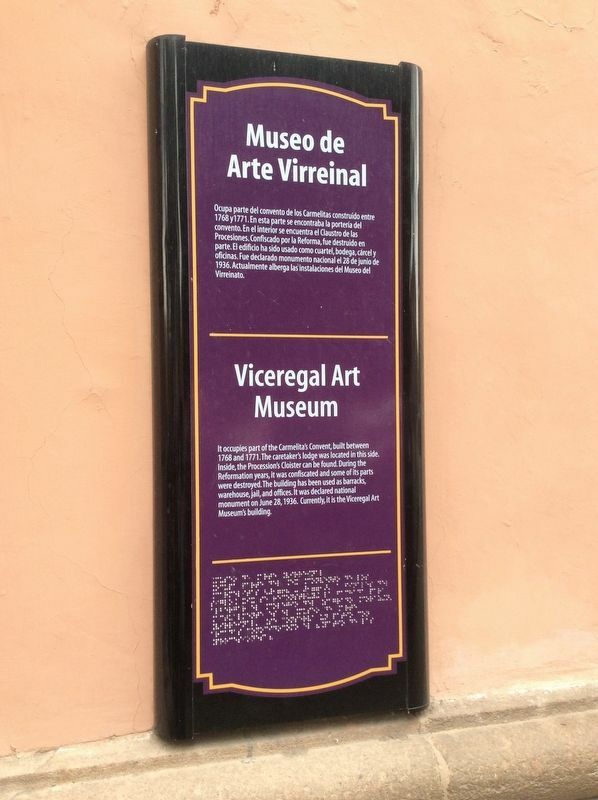 Search the internet for Viceregal Art Museum. Credits. This page was last revised on April 7, 2019. This page originally submitted on April 7, 2019, by J. Makali Bruton of Querétaro, Mexico. This page has been viewed 32 times since then. 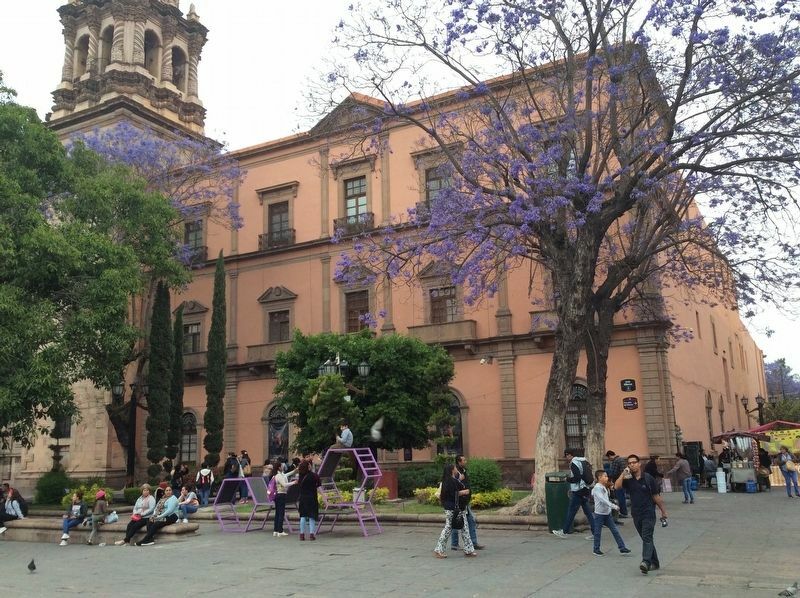 Photos: 1, 2, 3. submitted on April 7, 2019, by J. Makali Bruton of Querétaro, Mexico.